Normally with Wikidata we specify properties and get results that are identifiable things. For example if we ask for “female historians born in the 1730s with a biography in Electronic Enlightenment”, we get Catherine Macaulay. Here I’m using queries that specify a group of things and request the properties connecting them. So we get a tiny fragment of the Wikidata knowledge graph (which right now has just over 54 million people, places, publications, object and concepts). We can see how different kinds of data (biographical, bibliographic, and catalogue data) are combined in the same model. I’ve captured these graphs as screenshots, but I recommend clicking through to the live query where you get a draggable, stretchy graph. Note that these graphs exclude a lot of information for the sake of visual clarity. 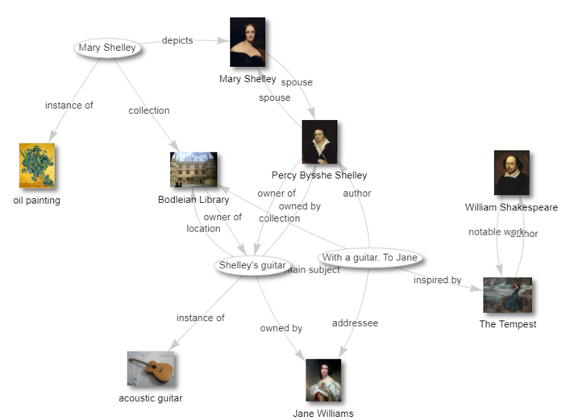 There are times and dates (so Wikidata knows that the Bodleian acquired the guitar after Jane Williams owned it). There are identifiers for the items (e.g. 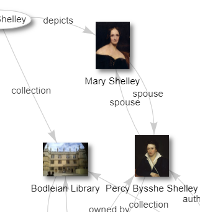 shelfmarks for the collection items; the dozens of authority file identifiers for Mary and Percy Shelley). 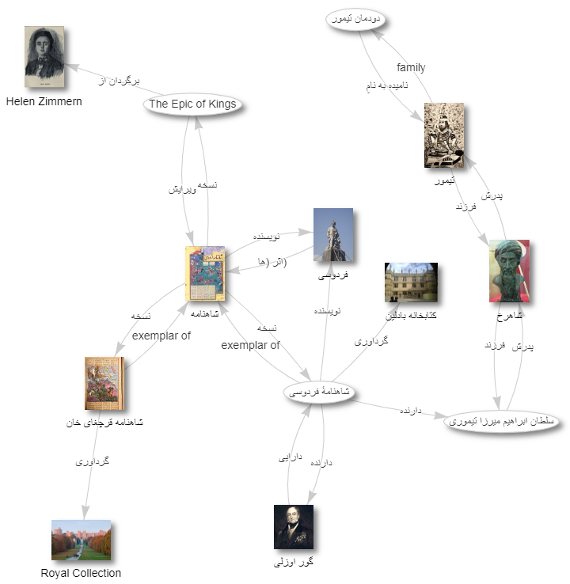 This is the same graph as before, but this time I requested labels in Farsi. This makes clear that Wikidata represents things in a language-independent way, and adds labels according to the users’ preferences. A few things and properties in this graph lack labels in Farsi, as is to be expected since it depends on human users to enter labels. There’s no machine-translation here. 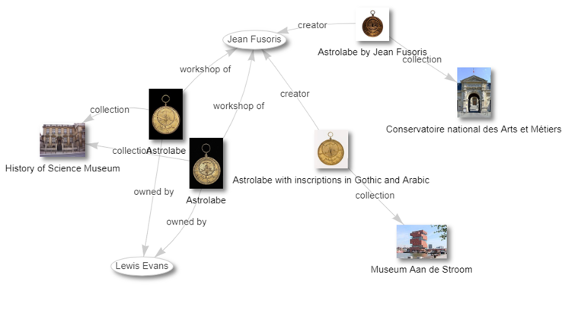 Still, we see Wikidata is capable of expressing to Farsi readers that Ibrahim Sultan’s manuscript was at one point owned by Sir Gore Ouseley and is now in the collection of the Bodleian Library. Remember that, if we fully extend them out, all these fragmentary graphs will ultimately connect to each other. 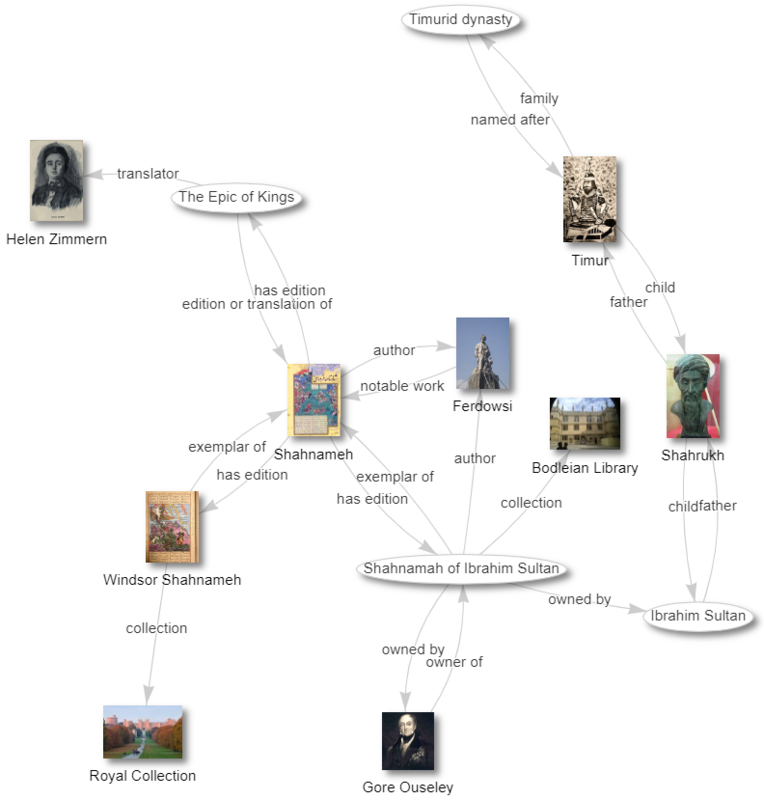 Wikidata is one graph connecting many millions of things together, and it in turn is part of the web of Linked Open Data, which connects millions more entites and properties. These graphs are a way to show what we mean by a knowledge graph, and what we’re doing when we combine separate data sets into a semantic web representation. They are not a navigational tool for the end user but they illustrate the problem we confront when we build interfaces to assist discovery: how do we make the relationships in a data set—the ones that are interesting to users—salient and easily navigable? 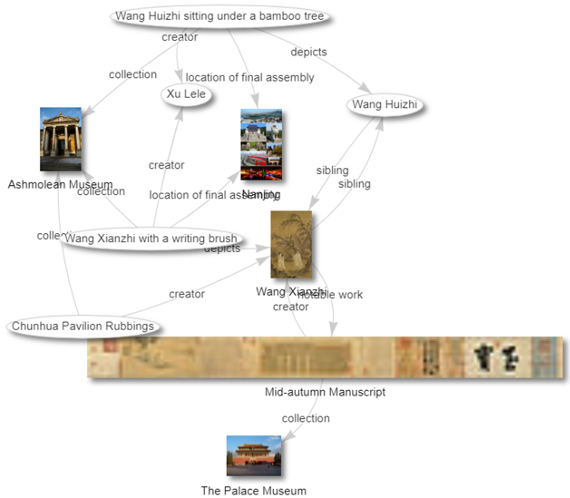 This entry was posted in digital humanities, open access by poulterm. Bookmark the permalink.